This review is for the second volume of Magical Girl Raising Project. This series is written by Asari Endou and features illustrations by Marui-no. The third volume is set to release March 20, 2018. There are 10 volumes in Japan at the moment, plus two side story volumes. 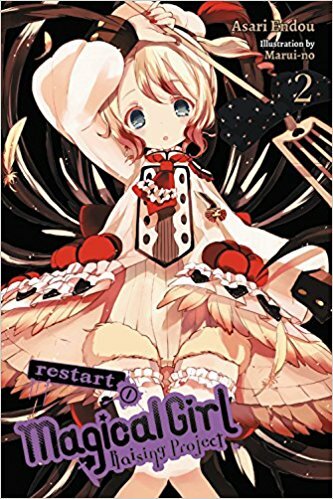 Just as I wasn’t sure what I was getting into for the first volume of this series, I had no idea how a sequel story would actually play out for Magical Girl Raising Project. Would it just be another random killing game with a new group of magical girls? Or would it somehow follow up on the catastrophe of the first volume, and pull off some kind of more complicated story? The answer turned out to lean more toward the latter, but the second volume ends without fully revealing how this new story ties with the previous one. The “Restart” story arc is a two-parter, so we won’t get a conclusion until volume 3 releases. One of the biggest differences between this story and the first is the nature of the game that the new cast of 16 magical girls are roped into. They are magically brought into a dangerous video game world, and the goal is simply to defeat monsters and win the game. It’s a setup I personally wasn’t excited about, since it’s such a common trope for light novels these days — but in this case it’s really just a means to an end, as little focus is actually given to the VR-esque setting. The point is simply to place the cast in a series of trying situations that couldn’t be managed as easily in the real world. The other biggest difference is in the nature of the killings that inevitably ensue. The first volume was very much a Battle Royale style of action thriller, in which characters directly fight and kill one another. The focus of the second volume is shifted somewhat to something more of a mystery thriller, in that certain deaths are being orchestrated by someone in secret. How some characters die is a mystery, who is killing them is a mystery, and why they’re being killed at all is a mystery. And going right along with that, it’s a mystery who is orchestrating the game in the first place, and what the actual purpose of it all might be. Fans of the Dangan Ronpa franchise will feel right at home with this new MGRP story arc. The fact this story is being told across two volumes also means we get more time to spend with all the characters, and thus get to learn more about all of them and get a bit more of an attachment to them before they die. There were some good surprises to be had in the first MGRP story, but the twists in this one feel weightier and leave a stronger impact. I feel this is largely thanks to the time taken to develop the characters a little further. Favorite characters of mine include Detec Bell, who liked solving mysteries so much she became a magical girl version of Sherlock Holmes, gaining the ability to talk to buildings; and Pfle, a young Machiavellian aristocrat who zips about in a high-speed wheelchair but manipulates others to do her bidding even quicker. There’s also a child dressed in a hamster suit, who has the ability to turn Godzilla-sized. How great is that? If you liked volume 1 of MGRP, I think you’ll like this one even more. Hurry and read it so that I’m not the only one in pain waiting for the second half of this story to release.